Let's get started with end-to-end service testing and see how ActFramework can make it easy to test your Java-based HTTP data services. I encourage you to follow the steps listed in this article and practice on your own computer. I guarantee it will be a nice and easy trip for you. For the last few years, more and more systems have applied a separated frontend/backend approach that lets frontend tech like Angular/React/Vue handle the presentation layer while leaving the backend a pure data service. In the world of Java, a lot of frameworks provide support for implementing HTTP data services, including Spring Boot, Jersey, and Play Framework; with fewer libraries for HTTP data service testing like Karate, REST assured, etc. In this article, we will introduce ActFramework and show how it is different in terms of expressiveness and simplicity compared with other frameworks/libraries for both HTTP data service implementation and testing. A very simple Java class, isn't it? With a single line in the main method, this class is responsible for bootstrapping ActFramework, which will scan all Java classes under the com.mycom.helloservice package. * The hello (`/hello`) endpoint. 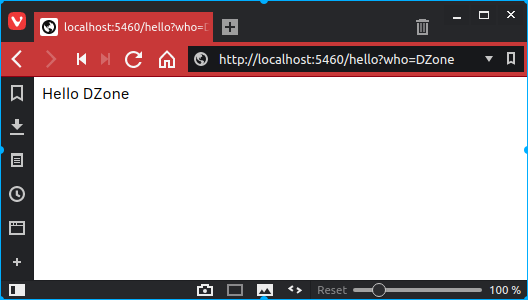 * return a greeting string in a form of "Hello $who"
*      request query parameter to specify the hello target. *      default value is `World`. * Returns an important date in history: 09/Mar/2016. These two endpoints are simple and easy to understand. [INFO] ShortRevision tag detected. The value is '4'. zen: Simple things should be simple, complex things should be possible. It takes 0s to run this scenario. text: Hello World # response text must be "Hello World"
- eq: Hello ActFramework # value must be equal to "Hello ActFramework"
- contains: ActFramework # value must contains "ActFramework"
- starts: Hello # value must starts with "Hello"
- ends: Framework # value must ends with "Framework"
result: Hello Java # result property of the JSON object must be "Hello World"
How to use Maven archetypes to create a new ActFramework application scaffold. The generated project structure and source code. How to test the application. The end-to-end test scenario definition. I hope by following the steps described in this article, you can get some understanding of the simplicity and expressiveness of ActFramework, and I hope you enjoy your journey. This is the first part of this ActFramework data service series. In the next article, we will revisit this project, add a more complicated endpoint, and write the new test scenario for it.